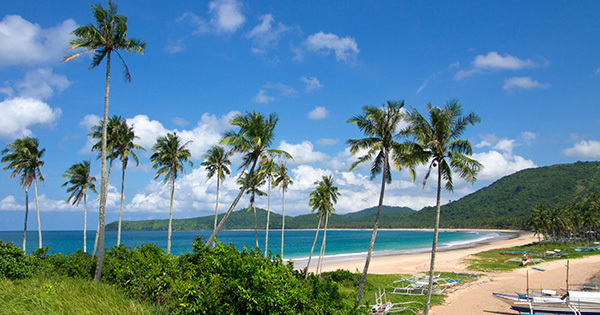 You will love, love, love the rainy or sunny days and the happy way you feel inside over at Nacpan Beach - a slice of heaven located in El Nido, Palawan Island in the Philippines. This pristine, white beach - which may be hard to reach - is worth every ounce of your strength to beseech! #2 - Friendly locals: Be greeted by the friendly resorts' staff as you stop for some drinks or grab something to eat at Nacpan Beach – that you’ll feel A-OK during your entire stay! #3 - Beautiful scenery: Although Nacpan Beach may be a long and bumpy ride by motorbike from El Nido town, once you step in, your jaw will literally drop due to surprise as you behold such amazingly clean and beautiful piece of paradise! Since it is an unspoiled beach, there is very little crowd so your privacy is a surety. Stop and stare as well at its super fine, white stretch of 4 - kilometer sand amidst many coconut trees, under either the clear blue cloudy or rainy skies! Picture perfect definitely, what with the clear blue water and a chance to snap pictures on top of the hill for that breathtaking panoramic view! #4 - Cuisine par excellence: Enjoy tasty Filipino food at the beach’s restaurant as you are served by the warm and sunny locals there. And if you are looking for a place to stay overnight, head on to Jack’s Place – Beach Park and Camping Site, for a simple yet stunning accommodation that will forever leave good impression in the pages of your adventuresome memory! #5 - The best sunshine and sunsets: Nacpan Beach, touted as a cut above the rest in the Philippines both locally and internationally, is no doubt THE place to bask in the warm sunshine should the season permit; there by providing you, your family or friends superb relaxation as you give each other your all, and bond to the max with the additional experience of witnessing a spectacular sunset at the end of the day.